A corrections officer was slashed in the face while he tried to break up a fight at Rikers Island, the union said. The guard was cut on his face from his ear to his jaw, according to COBA, the union representing corrections workers at Rikers. 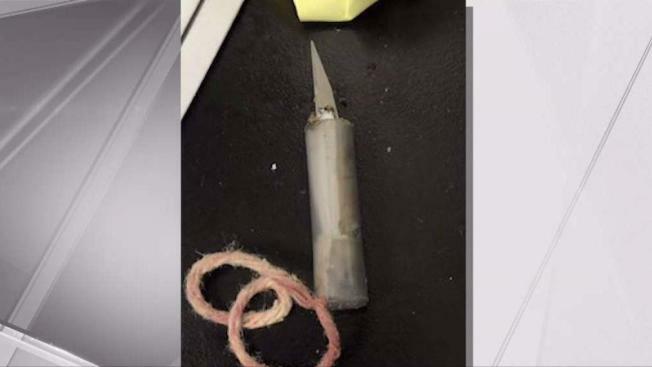 He was trying to break up a fight between gang members Friday night when he was cut by a knife that had apparently been fashioned out of contraband. Video of the assault shows inmates fighting, then the guard spraying some kind of substance before he was slashed. There is only one guard for every 50 inmates, COBA said. Elias Husamudeen, president of the union, called on the mayor and governor to install more protections for jail guards. He called for "punitive segregation," which allows guards to separate inmates based on behavior. He also called on Gov. Andrew Cuomo to sign a bill that would allow body scanners to detect hidden weapons on inmates. In a statement, City Council Speaker Corey Johnson called the attack "abhorrent and further proof that Rikers must close." "My thoughts are with the correction officer as he recovers, as well as all of those who work at Rikers and are forced to endure the never-ending violence that has plagued the jail," he said. "We are working to close Rikers so they will be safer."